myme.no - We're all Doomed! I spent most of 2017 getting used to Spacemacs, even though thoroughly enjoyed the novel experience, as the year progressed I did start to realize that this still wasn’t optimal. I didn’t want to switch out Evil (which is awesome), nor to begin rolling my own config (I’ve got no time for that). Yet the elephant in the room gradually got more apparent. With its enormous configuration, layers of abstractions, nuclear power plan included, Spacemacs does feel like it’s doing too much. It’s an amazing piece of software, but I didn’t find the performance I was after and (possibly worse) started feel a bit too removed from vanilla Emacs. A bit unsure of what exactly would set it apart from Spacemacs, I did decide to give it a try nonetheless. It is obviously a much smaller configuration1, and most likely has a much smaller user-base. But just having a look at the projects README.md and the accompanying screenshot got me curious. Wheras Spacemacs felt clunky and slow, Doom feels snappy and responsive. The configuration, being mostly maintained and driven by a single developer, is a lot more opinionated. This also gives a much more unified experience though, and the editor really feels state of the art without any sign of the decades old software underneath. I don’t know what’s with these Emacs config maintainers, but they never seem to be able to keep their master branches up to date. For Doom, at the time of writing, there’s no point trying anything other than develop. That being said; this guy’s a machine, churning out new features, responding to user feedback within minutes, and generally being polite and helpful when approached. If you want your editor to be solid as a rock, then Doom might not be what you’re after, at least not now. 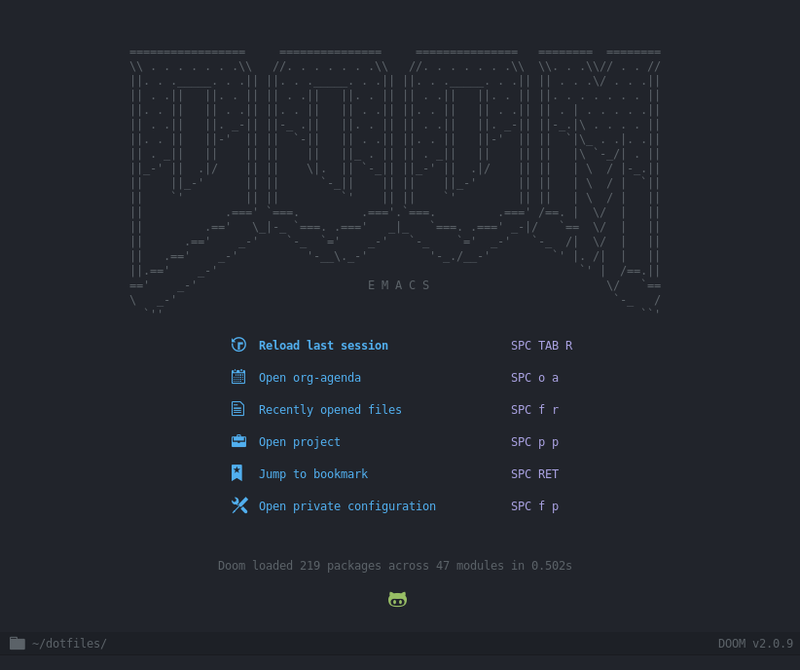 But if you need up-to-date plugins2, a great curated set of custom commands and macros, then Doom could be the config for you. I won’t ever say I’ve found my ultimate, never-ever-gonna-change-again setup. But this is starting to feel pretty darn close. I can’t say I spend much time reminiscing about my days using Vim though3. We’ll see how long this new venture lasts. It’s been two blazingly fast months already though!